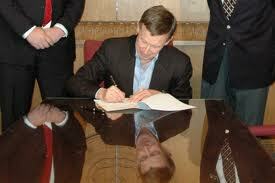 On Friday May 11 Governor Hickenlooper will sign House Bill 1140, "CONCERNING THE DUTIES OF THE DEPARTMENT OF PUBLIC HEALTH AND ENVIRONMENT AS COORDINATOR FOR SUICIDE PREVENTION PROGRAMS THROUGHOUT THE STATE", sponsored by Rep. Matt Jones and Sen. Linda Newell. "IN ITS ROLE AS COORDINATOR FOR SUICIDE PREVENTION PROGRAMS, THE DEPARTMENT MAY COLLABORATE WITH EACH FACILITY LICENSED OR CERTIFIED PURSUANT TO SECTION 25-1.5-103 IN ORDER TO COORDINATE SUICIDE PREVENTION SERVICES.WHEN A FACILITY TREATS A PERSON WHO HAS ATTEMPTED SUICIDE OR EXHIBITS A SUICIDAL GESTURE, THE FACILITY MAY PROVIDE ORAL AND WRITTEN INFORMATION OR EDUCATIONAL MATERIALS TO THE PERSON OR, IN THE CASE OF A MINOR, TO PARENTS, RELATIVES, OR OTHER RESPONSIBLE PERSONS TO WHOM THE MINOR WILL BE RELEASED, PRIOR TO THE PERSON'S RELEASE, REGARDING WARNING SIGNS OF DEPRESSION, RISK FACTORS OF SUICIDE, METHODS OF PREVENTING SUICIDE, AVAILABLE SUICIDE PREVENTION RESOURCES, AND ANY OTHER INFORMATION CONCERNING SUICIDE AWARENESS AND PREVENTION. THE DEPARTMENT MAY WORK WITH FACILITIES TO DETERMINE WHETHER AND WHERE GAPS EXIST IN SUICIDE PREVENTION PROGRAMS AND SERVICES, INCLUDING GAPS THAT MAY BE PRESENT IN..."
Colorado citizen Susan Marine was the inspiration for HB 1140. "I am passionate about the issue of preventing suicide because I am a survivor...Having lost two children to suicide, I act out of hope that other families might be spared this tragic kind of loss." Susan took her grief and turned it into action. She worked with her legislator, Rep. Matt Jones, D-Louisville, to develop the substance of a bill they believed would pass. She also devoted time and energy to help mobilize supporters to advocate on behalf of the bill as it moved through the legislative process. Click here to read a recent article about Susan's journey and HB1140, written by Moe Keller vice president of public policy for Mental Health America of Colorado. A death by suicide affects the entire community; it has a profound impact on family and friends, and the workplace, and results in an untold loss of productivity. To learn more about what you can do to prevent suicide in your community register for the Bridging the Divide Summit. Click here to learn more.